Register now for the Salmon University saltwater seminar! 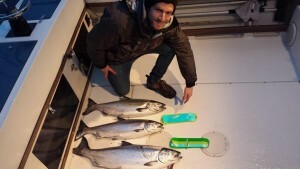 The Washington Department of Fish and Wildlife (WDFW) predicts “Fair” prospects for Chinook and “Poor” prospect for Coho during January in Marine Area 6. Area 7 was hot this weekend. We saw a lot of fish in the net, mostly shorts. We went 2/3 10-pound average. Great day to be on the water. Report submitted by Team Rod Dog Arches.The cover photo of this week’s fishing reports was also contributed by Rod Dog Arches. 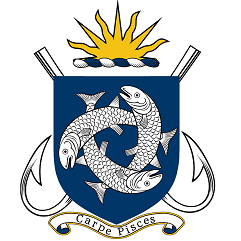 Fishing has picked up in the San Juan’s. Not consistently hot, but some larger fish have shown up. The weather has been very fishable as well. It’s a good time to get out and get some blackmouth. Get ready for the Area 9 Opener! It is time to re-spool those reels , dust off the rods, and prepare for the Area 9 Salmon opener this weekend. Don’t just assume that everything is ready to go on Saturday morning. Check out the boat, motor and safety gear to make sure that all is ready to go. Clean all the hardware and sharpen those hooks. If the hooks are worn, even a little bit, replace them. It is easy and smart. Make sure the downriggers are ready to go with no frays in the wire or knicks in the braid. Change out the lead ball snubbers as those balls will need to be pounding the bottom to find those blackmouth stirring up the gravel below. Finally, make sure the KatchKooler bag is clean and ready to be loaded ! The salmon fishing is currently closed in area 11 but area 13 from the Tacoma Narrows Bridge south is open for salmon fishing. The few reports that I have been getting indicate slow fishing recently. Try trolling Pt. Gibson, Green Pt. and the mouth of Wollochet Bay. Also, mooching Pt. Gibson can be productive. Squid fishing has slowed but there are still some squid being caught. The squid fishing is slowing some at the area docks so if you’ve ever wanted to try squid fishing time is running short. For more information call 253-591-5325. Sign up online at MetroParksTacoma.org/GO or 253-591-5325. 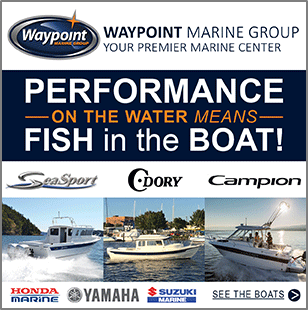 Report submitted by Point Defiance Marina. For more information contact: Art Tachell, Boathouse Marina Technician, 253.591.5325 art@tacomaparks.comwww.pointdefiancemarina.com. The Washington Department of Fish and Wildlife (WDFW) predicts “Fair” prospects for Cutthroat during January in Marine Area 12. The Washington Department of Fish and Wildlife (WDFW) predicts “Fair” prospects for Coho, and “Poor” prospects for Cutthroat during January in Marine Area 13. Winter Steelheading is full speed now that the rivers have finally dropped into fishable conditions!!! We’re catching 95% hatchery steelhead but have seen a few wilds and even a few late coho in the mix. This winters return of hatchery steelhead is the strongest so far that I’ve seen in a few years and we’re very excited!!! We have a few more weeks of prime fishing for keeper steelhead before the All Rivers & Saltwater team switches over to CPR fishing (catch, pic, release) for those majestic wild steelhead! Drifting cured eggs or small steelhead jigs under a float are the way to go right now! Report submitted by Mark Coleman, All River and Saltwater Charters; 425-736-8920. The cover image of this week’s fishing reports was also submitted by Mark. The author with a nice Lake Sammamish Cutthroat! On Friday, I fished Lake Sammamish with my friend Nick from the Renton Chapter of Puget Sound Anglers. Our plan was to troll for trout and then jig for perch if time permitted. Nick had recently fished the lake and did extremely well for trout. However, fog had been an issue, so we launched at the very reasonable time of 11:00 in the morning. And even then it was very foggy. As we motored down the lake, we had to pick our path carefully as the fog still limited visibly to several hundred yards. We were not too worried about encountering another boat as there were only a half dozen trailers in packing lot. However, there was a lot of woody debris in the lake from the recent heavy rains and we wanted to avoid hitting any of that. We made it as far as the weather buoy and decided to fish there. I put on a number 3 Needle Fish in the Fire Tiger pattern and fished it off the downrigger starting at 20 feet. I ran my gear back about 100 feet as the cutthroat are very boat shy. Nick also used a Needle Fish but in the Copper with Red Head pattern. However, he was using leaded line with a 50 foot “top shot” of mono. He let out four colors and we estimated we were fishing about the same depth. After an hour of not getting any the bites, the fog cleared considerably, so we decided to run farther north and try our luck there. This was the area where Nick was having his best luck on previous trips. We saw a lot of fish on the sonar at 60 feet, so I dropped my gear down there but still had no luck. The sun became brighter as we trolled back to the weather buoy, and then we noticed a bug hatch starting. I switched to a green woolly bugger and dropped it down to 20 feet. Within 5 minutes, my rod started pumping as a fish ripped my line out the release clip. The 19-inch cutthroat trout put up a great fight on ultra-light gear and we were surprised when it stayed on after numerous jumps out of the water! This is because single point barbless hooks are required on the Lake from January first until April first. This rule is to facilitate the release of Kokanee. But luck was with us and Nick was able to net this very tasty specimen. Our luck continued as we trolled around the weather buoy. Both Nick and I got numerous bites for the next 90 minutes. And the good bite was not limited to us. Another boat joined us and the lone angler also hooked several fish. However, our luck was not all good. Because as the bite picked up we starting losing more fish. We were only able to land one cutthroat for every four that we hooked, but it was still great fun. Then just as suddenly as the bite started, it stopped. We fished the same area for another hour and without a bump. We decided to move over and fish near the mouth of Issaquah Creek. There, we saw huge numbers of fish on the depth finder and got several “drive by” strikes but were not able to hook any of them. The fish just seemed unwilling to commit. We were running out of light so we decided to head in. We had a great time fishing on a really nice day. Plus, we got enough for a nice meal of really tasty trout for my family. 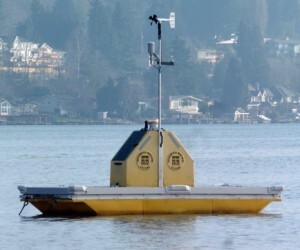 I hope you have a chance to get out and try your luck on Lake Sammamish in the near future. 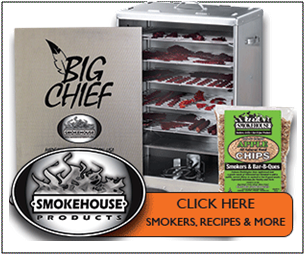 It offers great potential and is a really underutilized fishery this time of year! One tip, I wish I thought about when we were on the lake that I think would have increased our success, especially with the woolly bugger. That tip is putting a Pro-Troll 4-inch Pro-Chip flasher in front of your offering. They are Super UV with glow back. I think they would have really helped with the low light conditions we had much of the time. 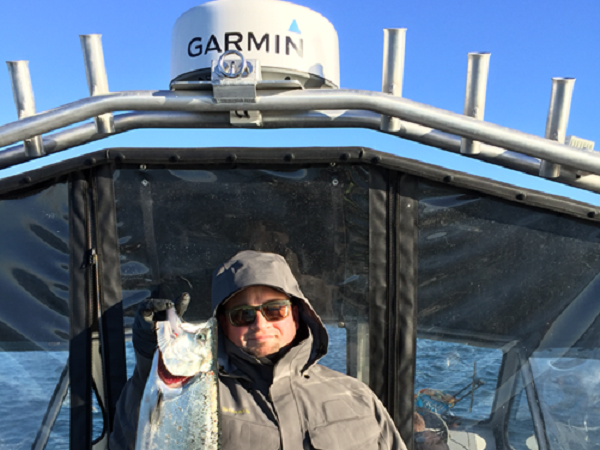 Mark Gavin is a Salmon University staff member and an active member of several Puget Sound Angler Chapters. At the Potholes there has been very little access for fishing with temperatures at and below freezing. While Moses Lake is still frozen over the only sigh I have seen for Potholes is signs of holes up by M street on Linn Coulee. Short term forecast is for a slight and temporary rise in temperatures. Launches are still froze in. Report submitted by Tom Pollack. Razor Clamming got off to a late start this year in Washington State due to toxins being too high. The first digs at the coast didn’t happen until around Christmas this year. I haven’t dug razor clams in two years and I was anxious to bring a group of newbies out to give it a try. If you’re like me and want to be away from the crowds, head north of Ocean Shores for Copalis Beach. There are some great places to stay the night close to the beach; many with cleaning stations for your clams. With a 6:16pm negative tide, I rallied our group to get out early to try and dig our limit in the daylight. It was easy limits. Even the beginners in our group did well. We managed to get our limit of 15 clams each in under an hour and then enjoyed some celebratory drinks back at our room. 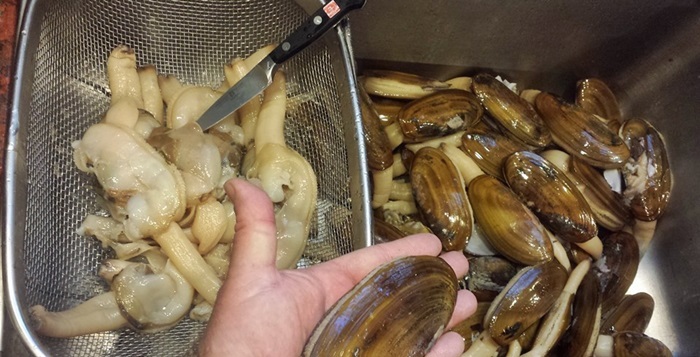 After cleaning our clams we were amazed to have gotten 10 lbs of cleaned razor clam meat from 60 clams harvested. If vacuum sealed and frozen, razor clams keep quite well. Submitted by Brad Hole, Kayak Fishing Washington, 206-313-5567–kayakfishingwashington.com. The cover image of this week’s fishing reports was also submitted by Brad. Winter chinook season is now in full swing in local waters! We have had a very encouraging start to the fishery and things look promising for the next few months. On most days, we have been having good success hooking good numbers of fish in the 5 to 15 pound range. Most of our charters recently have been averaging 5 to 12 hook ups an outing. As we progress into January, February, and March we should see waves of feeding winter chinook salmon move around Howe Sound, Vancouver Harbour and the Gulf Island’s. Now we are getting closer to the herring spawn, we will start to see some larger fish move into local waters. We have had reports of fish of 20 plus pounds caught on the weekend. Crabbing has been very good in English Bay and prawning has been decent in Howe Sound. We have been using a few of our favourite set ups so far this year with good success. The Gibbs Delta G Force Trailhead and Bon Chovy Spoon in the 3.0 and 3.5 size, Silver Horde Homeland Security in the 3.0 and green/glow Irish Cream Coho Killers have been our best producers recently. In terms of flashers, we have had most of our success with the Guide Series Lemon Lime, but we have also had some good results with the STS, Madi, and Bonchovy. From January 15th to March 31st we are running our annual Winter Chinook Charter Special. Right now our Canadian dollar is at a 15 year low and the savings for our clients from the United States is crazy. With the exchange rate being so lopsided, we have some amazing rates for day charters and overnight packages complete with waterfront accommodations. We have full day trips for 4 people on for $565.00 US per boat. A package with 2 full days fishing and one night accommodation at a seaside cabin is $399.00 US per person based on 4 people on a boat! Please call or email for more details! Great rates for a winter fishing trip. 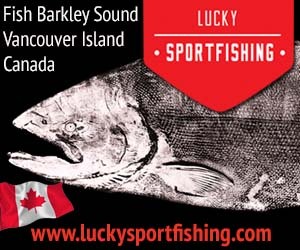 For more info call Jeff or Jason at Bon Chovy Fishing Charters (604) 763-5460, bonchovy.com email: info@bonchovy.com. Salmon fishing was GOOD for anglers in East Sooke. Anglers were reporting good success in the bay for springs up to 16 lbs. Inside of Frazer Island and towards the marina has been the spot. It’s also been good over by the Trap shack and Whirl Bay. Most of the fish being brought back to the marina weigh between 5-8 lbs in size. Anchovies in glow teaser heads have been very effective in luring the winter springs. Spoons, such as the G-Force and Skinny G, in the Bon Chovy or Irish Cream colours were effective. For flashers, the Lemon Lime and the Purple Onion have been good. Salmon fishing was FAIR this past week. Most salmon were caught when fishing with lures right on the bottom (60-110 ft) on the Flats and by the Gap. 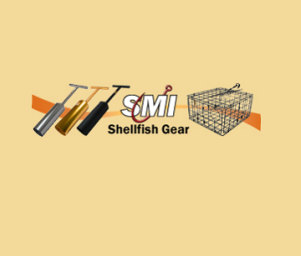 The fish were hitting needlefish spoon and squirts. G-force and Skinny G spoons in No Bananas and Outfitter colours worked just fine. Coho Killers in Gold Nugget and Green Splatterback have been pretty productive too. The best flasher has been the Gibbs Lemon Lime and the Bon Chovy. Salmon fishing was GOOD this past weekend. Those who did go out caught fish that were mostly in the 2-5 lb range. Most of the fish were caught close to the bottom in 120-150 feet of water inside the bay by the Navy Buoy. The trolling pattern has been to do figure eights between the Deep Hole and the Can Buoy. The anglers are fishing close to the bottom are often bouncing the downrigger balls on the bottom. Small spoons, such as the G-Force, Coyote and Gypsy, in the glow and/or any bright colours were very effective. Hootchies and squirts also produced well. Flashers that remain popular include Glow green, Lemon-Lime and Purple Onion. And you can’t go wrong fishing anchovies in a Bloody Nose teaser. Salmon fishing was SLOW near Sidney. Most of the winter springs have been short of the minimum size for retention and we haven’t heard of any keepers caught this past week. Most anglers are fishing using anchovies in Bloody Nose and UV Green teaser heads. Coho Killer spoons have also been working well, especially in double glow and Gold Nugget. Prawning is now closed in Saanich Inlet. The salmon fishing was FAIR recently but still not a lot of anglers out fishing. There are lots of undersize springs off Sooke right now but also larger keepers. It’s been good around the 140 foot contour. 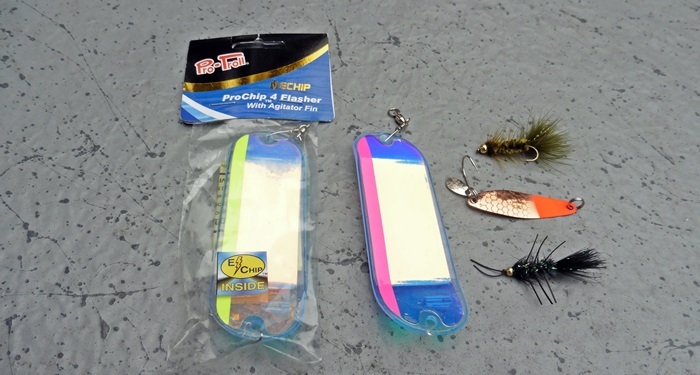 The 3”-4” Coyote, Gypsy and G-Force spoons, as well as hoochies, are the top choices for Sooke anglers. G-Force spoons in Outfitters, Irish Cream and No Bananas have been very popular. Hoochies in White Glow, Army Truck and Tiger Prawn have been catching their fair number of fish. The most popular flashers recently have been the Purple Onion, the Gibbs Outfitter and the Lemon Lime. Fishing for salmon was GOOD off Victoria. The salmon were moving along the waterfront from Albert Head to Trial Island and out at Constance Bank. Constance Bank has been good when it wasn’t blowing too hard. We’ve heard of springs into the low teens caught out there this past week. Closer in, we’ve heard that the 140 foot contour has been good along the waterfront and the 90 foot contour at the harbour entrance. Alex Green landed a beauty 14.5 lb spring at the harbour entrance. Anchovies, spoons and squirts were successful in getting hook ups. Bloody Nose and Purple Haze have been the most popular colors for teaser heads. Good choices in plastic baits are the Electric Chair, Purple Haze and White Glow. Coho Killers, AP Needlefish, G Force and Coyote spoons in Green Splatterback, Moon Glow and glow white & green colours have also been good. The Purple Onion and Bon Chovy flashers have been popular recently. Water levels have been dropping fairly steadily and clearing since it blew out on December 13th. Today the water level is 1.02meters near the lake and 1.0 meters near Duncan. Winter steelheading is now the focus on the river. We’ve heard of good numbers of steelhead being caught and released in the river recently, mostly in the Riverbottom area. The Riverbottom and Bible Camp area has been the best area to fish and is fairly good to wade at these water levels. For steelhead, good lures to fish are Spin ‘n Glo’s, Beads and yarn, Gooey Bobs and the always reliable Pink Worm. Spoons can also be a great lure in these conditions. Fly fishing for trout at the top end of the river has been good. Fishing is FAIR in most lakes. Wild rainbows and cutthroats over 50 cm must be released in Cowichan Lake, but the fishing has been good for these large trout. The Oregon Department of Fish and Wildlife reports that catch-and-release for sturgeon may be good and recommends fishing the channel edges on the outgoing tides.